from 3 pcs. 5,84 EUR ea. from 10 pcs. 5,16 EUR ea. from 20 pcs. 4,83 EUR ea. from 40 pcs. 4,54 EUR ea. 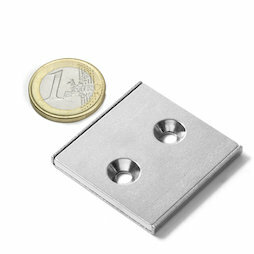 This screw-on channel magnet is a square flat countersunk block magnet with two boreholes, embedded in a U-shaped steel profile. 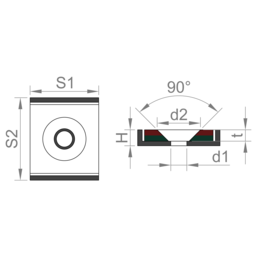 The steel significantly reinforces the magnet's adhesive force at direct contact and at the same time protects it from blows. Its thickness of only 4 mm allows for hanging up signs, tools, etc. discreetly. It is especially suitable for carpentry, kitchen/booth/store construction, and signage technology.